underwear which has a English flag design. Words spelled on his t-shirt says "KNOCK YOU OUT!" Seems like Frazer wants to start his own boxing tournament with his audience! 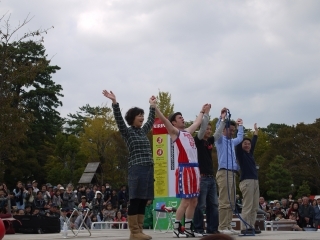 just some volunteer on stage, but have a role of their own. makes this boxing match exciting!" Come and watch Frazer's show, you may possibly be the next contestant! True traditional performer family, "WOLF BROTHERS & HELENA"
WOLF BLOTHERS & HELENA comes from the Czech Republic. The team was made 10 years ago. so as an audience, we are fascinated by their performance. 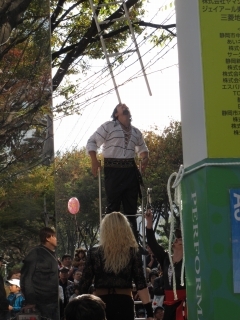 On the other hand, most of their performance are dangerous. So audiences tremble to think how it would end. and she is a wonderful performer suitable for the traditional family. performance of 5 generations traditional performer's family! Simply he is really funny.I enjoyed his show so much.His loud laughter invites more laughter. even if it is very funny,it can be uncouth.But that's his comedy show and it is completely ridicurous!Don't withhold your laughter. He reminds all of us that everyday is full of amusement.He is a genius in finding something funny. but his family is used to his jokes and sometimes gives crittical and unkind comments.He receives them sincerely and try to find new laugh for his next show. Come see his show and let's have a lot of fun and join in the great laugh. 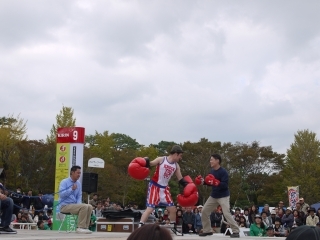 Wegenstreits Guests were invited to DAIDOGEI Worldcup in Shizuoka. They are from the Theater Irrwisch, Vienna. 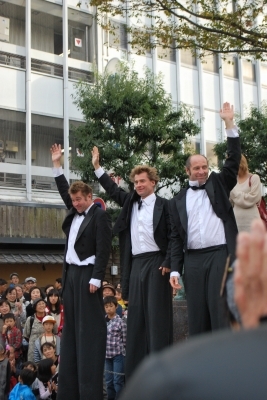 Three gentlemen are formaly dressed. They are typical Viennese gentlemen. However, they are funny and they have too long legs! anyone young, old, male and female couldn't help but take notice them and laugh. 21 years ago, three young men discovered each other and started new lives as DAIDOGEI performers. They named the group "Theater Irrwisch". Thater Irrwisch seems to have a deep history. It's so hard to wait for seeing the performance and asking the history of Theater Irrwisch until the next time. two artists from China, the Duo Yingling, are here to perform their distinctive and mysterious acrobatic show. Training twenty years together, the two knows each other like sisters, and have a perfect synronization in their act. With tremendous flexibility, the two can perform difficult act with ease. Spinning towels and spear with their hand and arm, you will be amazed at what they can do. Combining their own ideas into the traditional chinese acrobat, the Duo Yingling will have you cheering in amazement! I asked what they do to maintain such a athletic body, and they told me "Nothing special, we eat alot of vegetables, practice, and not eat too much fast food. We also practice 8 hours a day, and only rest on Sundays. It's not easy." You can say that practicing over and over creates the backbone to their successful performance. two currently resides in England and Germany, and are flying to Finland after the World Cup. There is not much time left, don't miss their performance! One of the most essential performances in this festival might be face paint. 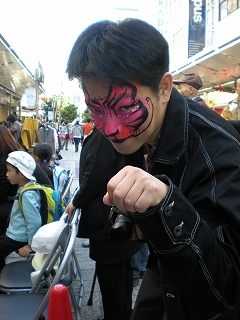 This interviewee (from Toyota city, Aichi pref.) challenges face paint EVERY YEAR!! 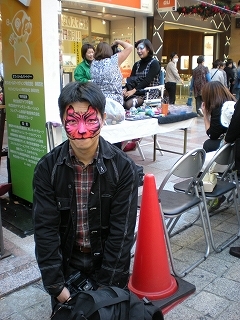 Today, he transformed into the Cheshire Cat as a cat fancier. For him, this transformation is one of the most important event for reducing stress of daily work. So, why not come and transform yourself in both face and mind?